Training in Automation PLC, SCADA, DCS C-300, HMI, Instrumentation, Embedded & VLSI, Oil and gas training, QaQC Training, CCNA Cisco Training, MEP HVAC BMS Training, Autocad Revit MEP Training, Safety Engineering, Power and Electrical Training. 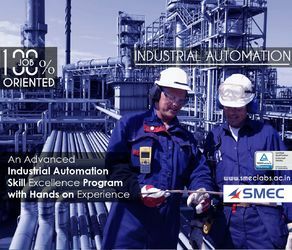 SMEClabs is the research, development and training wing of SMEC, an ISO 9001:2008 certified global solution provider and the Authorized System Integrator of Schneider Electric, VAF, Kangrim boilers, Bosch Rexroth, DEIF, D , Stx Europe.We are in the field of Industrial, Oil and Gas and marine sector works since 2001. We celebrated our 17th Anniversary on February 2016.Best training center in India. Our Skill developement Programmes are affilited by National and International Skill Development authorities. The training programmes are approved by ISA International Society for Automation, TUV Rheinland Germany, ASNT American Society for Nondestructive Testing, AWS American Welding Society, Cisco, NIELIT National Institute of Electronics & Information Technology, Govt. of India, ESSCI Electronics Sector Skills Council of India, CGSC Capital Goods Skill Council, KASE Kerala Academy for Skills Excellence, Govt. of Kerala, IASC Instrumentation Automation Surveillance & Communication Sector Skill Council, STED , SIDCO Kerala.